The day started in Padstow, a beautiful harbour town on the north coast of Cornwall. I was lucky enough that my bedroom overlooked the harbour and beaches across the estuary. Some of my favourite things to do there include renting bikes for rides along the Camel Trail and walking to the nearby beaches to enjoy the sunshine! It didn't take long to get to Port Isaac from Padstow and as it was still quite early (in the day and the season too) the village was pretty quiet and there weren't many people around. It's a very small fishing village with really pretty views of the sea and picturesque streets. I was glad that I wore flat shoes as there were a lot of steep hills! The drive from Port Isaac to the village of Tintagel took a little longer but was worth it for the pretty scenery and sunshine! I've done a blog post all about Tintagel Castle (which you can check out here) so I won't go into it too much but I had wanted to go for ages and wasn't disappointed! We stopped before for lunch and then tackled the many many steps to the top of the cliffs! The sea was such a beautiful colour and I even spotted some seals in the water. After stopping to do a bit of mandatory tourist shopping, we got back in the car to drive to Devon for the next stop! Have you been to Cornwall before? Woww!! Such a amazing pictures!! I would like to be there!! Looks like a supr nice trip! Such a beautiful place! Never been in Cornwall, looks incredible! Seems like it was a great road trip! Have a lovely day! Now I'm a bit sad I have never been to Cornwall. Wow, the water is so blue. Gorgeous! Wow, these pics are beyond beautiful! I've been too in Cornwall and Tintagel 2 years ago, very interesting and suggestive places! Beautiful photos! I would love to visit Cornwall! Beautiful place ! Love these pictures ! I've never been to Cornwall. It looks like an amazing place. I've never heard of Cornwall before! This is one of the reasons I enjoy your blog, you always introduce me to different places in England that I might not have otherwise learned of, thank you :) It looks beautiful there and I'm glad you enjoyed your time spent. Thanks again for sharing and I hope you're having a great week so far! Wowwww... amazing place and wonderful pics!!! Great post! The photos are exeptional. Looks like a fantastic road trip - Cornwall is such a beautiful part of the world :-) Have a nice weekend! I haven't been to Cornwall before, so thanks for sharing your journey with us. Helps and gives people the idea for places to visit. Great shots here. Gorgeous shots! Can't beat a good roadtrip when the sun is shining and you have views like this! I haven't been to Cornwall yet, but hopefully we will get there this year! It looks beautiful. This has been such a lovely read (lovely images too!) and especially as I'm heading that way in about a month's time to explore for a few days!! 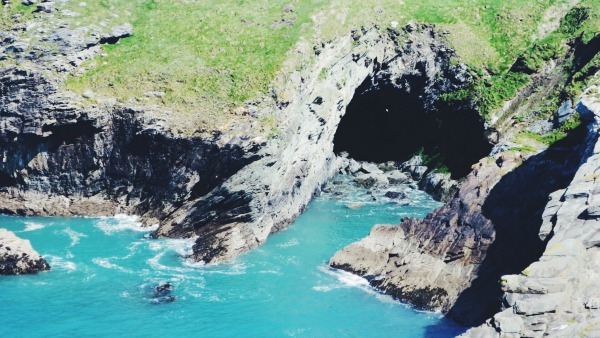 Tintagel looks really special.